Teaching users how to use our apps is incredibly important. We should strive to do this through familiar UI patterns, intuitive flows, good error handling, etc. Sometimes though, we just need to explain what's going on. Today we'll look at a fantastic new project from Frédéric Maquin called Instructions that can help us do just that. It's a library for easily adding "coach marks" to our apps. Let's dive in. Next, we'll extend our view controller so it conforms to the CoachMarksControllerDataSource protocol. Instructions is highly customizable. It has support for custom body and arrow views, positions, highlights, and more. Let's keep things simple here and add a regular coach mark for a button in our app. 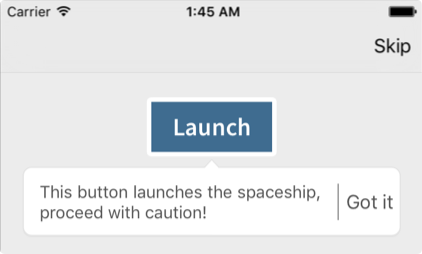 coachViews.bodyView.hintLabel.text = "This button launches the spaceship, proceed with caution!"